Impulse shopping can be very bad for your purse strings. But when it’s the MAC Pastelluxe Veluxe Pearlfusion Shadow, maybe it’s better that your purse doesn’t have strings. It goes both ways – this palette can either be a great buy, or the complete opposite, depending on you. Let me explain. The first four shades are super duper glittery and when applied dry, the glitter flies all over the place! On your bottom lids, cheekbones, dresser top, fingers, clothes… There are glitter flecks of different sizes and no prizes to guessing correctly which ones are the hardest to remove from surfaces! However, when applied wet, they are more well-behaved and go where they’re supposed to. The drawback is this: that even when used with a wet brush, the eyeshadows come off way too easily with a swipe of a piece of dry tissue. The only shade that acts like a normal eyeshadow is the last one (Mid-tone Beige Grey), which is more shimmer than glitter. 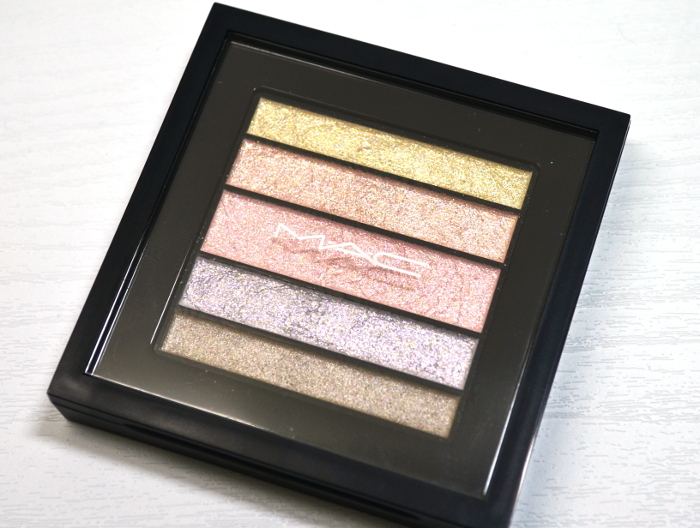 The MAC Pastelluxe Veluxe Pearlfusion Shadow palette. Swatches of the MAC Pastelluxe Veluxe Pearlfusion Shadows, taken with flash. The only way to make them stay is prime, prime, prime! The best way to get the most out of this palette is to use an eyeshadow primer (my favourite is Urban Decay‘s Primer Potion), first adding some onto your brush and then adding – and blending – some directly onto your skin. In this way, the glitter stays on for hours. When I tested it out, this method took my eyeshadow through an hour-long pilates session with slight fallout. If you ask whether I’ll recommend this palette, I’d say probably not, especially if you’re a novice in makeup. The reason the glitter requires a primer is simply because it’s not mineral makeup, which can make it quite tricky to handle. Even I will not use this much, unless it’s for a night event where I’m ready to have some sparkles fall on my cheeks throughout the night. If you’re looking for some glitter to add on to a smokey eye, I’d direct you to the Make Up For Ever glitter instead (see the look I created here). Review & Swatch: The MAC Pastelluxe Veluxe Pearlfusion Shadow was last modified: August 31st, 2013 by Roxanne C.